When you are looking for a youth bow it is important to remember who it is for. Often adults take their own preferences into consideration, forgetting that it should be up to the child. If the bow isn’t comfortable for kids to use or if it is too difficult to shoot, most kids will give up on the sport leaving you with an expensive mistake. When you are trying to find a bow that your kids will actually use there are a few aspects to consider, and the following tips can help you make a decision that will make everyone happy. Beginners will love this bow designed to reduce let-off to zero so that you can hold the bow at full draw without risking premature shots. Even people who are not athletic will find it easy to use this bow. There is no such thing as draw length requirements, as the bow adjusts to a growing archer. The varying draw length is between 15 inches and 30 inches, which is enough for anyone, regardless of skill and preferences. The draw weight is 20 pounds, but it can be decreased to 10 pounds, with the help of a hex wrench that is thoughtfully provided by the manufacturer in the same package. Made from aluminum, it is both lightweight and durable. The composite limbs also contribute to its robust construction, and the molded grip will provide extra comfort for the shooter. It helps to know that the riser is pre-drilled and tapped so that you can add accessories. The variable draw weight and length make this bow an excellent idea for a growing archer. The draw weight goes from 12 pounds to 29 pounds, while the length varies between 16 ½ inches and 26 inches, allowing any novice to grow with the bow. You will get some beautiful accessories, such as a quiver and an armguard. Ideal for shooters of 10 years of age or older, the compound bow is pretty basic, but it caters to all the necessities of a beginner who is yet to hone his or her skills. For target practice, you can hardly do any better, so anyone taking up archery can use it. You will like the fact that two fiberglass arrows are included with your purchase. A pin sight, an arrow rest, and three finger rollers are also provided with your purchase so that your son or daughter can enjoy the bow right out of the package. This is a small compound bow, as it measures 26 inches axle to axle, and that should give you an indication about the ideal age of the archer who is supposed to train with it. While other models for young archers tend to be oriented toward ages of 10 years old and above, this one caters to archers as young as eight years old. Both the draw length and weight are variable, the length being adjustable between 15 inches and 20 inches, while the weight can be modified between 15 pounds and 20 pounds. This plastic bow is lightweight, and it can be used successfully to educate a young archer. The 6-inch brace height is a great plus because it offers extra comfort. The 65% let off is a contributing factor to comfort when holding the bow at full draw, and it must be noted that the model comes with composite limbs. The youngest archer in your family might like this bow quite a lot since it is designed to help a novice hone his or her skills. 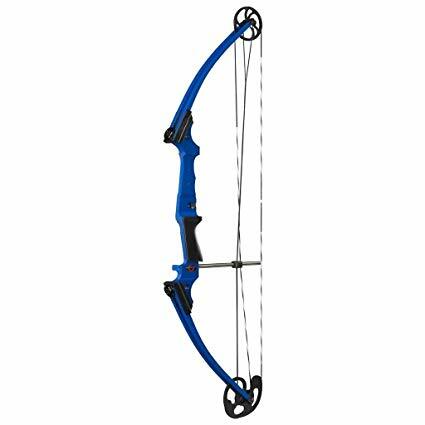 Even if your son or daughter is taking up archery, you will discover that this compound bow is just what’s needed, for the simple fact that it comes along with all the required features and accessories for target practice. One thing that most people want to know about a compound bow addressed to young archers is how adjustable the draw length and weight are. In this case, the draw length can be adjusted between 20 inches and 22 inches, with increments of one inch. The draw weight varies between 17 pounds and 22 pounds. Other aspects you should know about this particular model are the included Brightglo sight, two arrows, and Soft Touch finger rollers. With their help, any young archer will be ready for target practice. You will get more than just a compound bow with your purchase, you will get an entire kit. The model is sold along with two composite arrows, the necessary quiver for them, an armguard, an arrow rest, sights and finger tab. Young archers will love how much like the real thing this model looks. And it is not just the looks that make this bow as close to a full-size compound model. It is made with composite limbs, and the riser is also made from composite, so don’t be surprised at the robust feel you will experience when holding this bow in your hands. That’s not all. The cam system comes with all-weather strings, as well as cables and a cable guard that contribute to the high precision and performance of this bow. The model measures 33 inches axle to axle, and it has a variable draw weight, between 17 pounds and 21 pounds. Regarding adjustability, the Barnett Vortex 45-Pounds makes an impression, since its draw weight can be modified between 19 pounds and 45 pounds. If you want a compound bow that will grow with your son or daughter, this one is undoubtedly a good pick. It must be noted that the draw modules make adjusting the bow a breeze. The draw length is between 22 inches and 27 inches, another example of how adjustable this model is so that it can deliver the same reliable performance all the time for an archer honing his or her skills, with time. You will like the fact that the model is delivered with three arrows and an arrow holder. Any young archer can grab the bow and start shooting right away. Also, seeing how the manufacturer offers a 5-year warranty with this model, it is a sound investment to consider. You might have already heard about Bear Archery, as being one of the most critical bow manufacturers in the US. This model, destined to inspire a love for archery in young shooters that can last a lifetime, is one example of the company’s dedication to quality and performance. The Brave bow measures 26 inches axle to axle, so it is pretty compact, to begin with. You will get a plethora of accessories with your purchase. First things first, there are two Safetyglass arrows available so that any young archer can start shooting. An interesting aspect is that the manufacturer includes a whisker biscuit for the arrow rest and that alone amounts to great value for the entire set. With adjustable draw weight, it is the type of compound bow that will grow with your little one. Seeing how you get a pin sight, a quiver, an armguard, and finger rollers with the package, we can say that it is a complete option to consider. The vast range of adjustability makes this youth compound bow a great choice, should your son or daughter consider taking up archery and holding onto it for several years. The draw length goes from 19 inches to 29 inches, and you won’t need a special press to adjust it. Similarly, the draw weight varies from 15 pounds to 55 pounds, something that is not easily equaled by other compound bows. With a brace height of a little over 7 inches, this bow is quite forgiving for beginners. Seeing how its body mass is 2.8 pounds, it is lightweight and easy to hold by a young archer. Even for people who want to try their hand at bow fishing, this model is great to have. Available in Combat black finish, it is an attractive bow, as well. Along with it, you will get an arrow rest, a quiver for four arrows, and two aluminum arrows so that you can start practicing right away. A model that comes ready to hunt, the Bear Archery Apprentice III is for the young archer looking to do more than engage in some target practice. Equipped with high-quality accessories, it is the type of compound bow that will do a great job regardless of what you intend to use it for. Let’s take a look at the accessories, and you will see exactly what we mean by that. You will get a whisker biscuit with your purchase, which is considered the safest rest currently sold on the market. This accessory alone saves you up some money, which means that the final cost of the package won’t seem as much, in perspective. You will also get a plethora of Trophy Ridge accessories, such as a sight, a stabilizer, and a quiver. Users receive an adjustable bow whose draw length goes from 15 inches to 27 inches and draw weight from 20 pounds to 60 pounds. It is easy to grow up and hone your skills with this compound bow, as a result. When you are trying to decide on a budget don’t forget who the bow is for. If you child is just starting out chances are you don’t need to spend a lot of money on the most expensive youth bow. This also applies if the bow is going to mainly be used for fun or if your child isn’t even sure if they will like archery. As they get older and their skills begin to improve then you might want to consider spending a little more for a higher quality bow, but in the beginning it simply makes sense to save your money and purchase a less expensive model. While there are ambidextrous bows, it is still a good idea to see if your child needs a right or left handed model. Not only will this be more comfortable to use, it can also make it easier for your child to work on improving their skills. A quick and easy way to determine which type of bow is best for your child is to have them face a clock or picture hanging on the wall and point to it with his finger. While he is pointing at the image have your child close his right eye, if the finger moves you will want to choose a right handed bow and if it stays in place a left handed model will probably be the most comfortable to use. You will also want to consider the child’s age when you are looking for a youth bow. Some models have the recommended ages listed in the product description, while others are designed to grow with the child. When it comes to choosing a youth bow based on the child’s age, chances are you are the best one to make that decision. The overall weight of the bow is important for comfort and safety. If the bow is too heavy a child won’t be able to hold it, and it can even cause painful injuries. If the child is older it will be a little easier to find the right bow, but it can be more difficult to find one that is designed for smaller children. This is due to the fact that not all manufacturers have lightweight bows that are designed for children under the age of 10. Most experts recommend letting smaller children try and hold the bow before purchasing it, but if this is not an option than it is best to start with a lightweight model. Children under five should always start with a bow that weighs 3 pounds or less, and this is also true if the child is small or petite for their age. In some cases this might mean that your kid will quickly outgrow the bow, but it is still better to think about safety instead of trying to save some money on a model that could be dangerous or uncomfortable for them to use. Health professionals all agree that trying to draw a bow that is too heavy can be detrimental to a child’s growing body. To prevent injuries to growing muscles and bones, it is important to make sure that your youngster can easily draw the bow back without overly straining. Since all youth bows have the draw weight listing in the product description it is pretty easy to see which one might be right for your child. One average most children under 4 years of age should never attempt to use a bow with a draw weight over 10 pounds, and this is true until kids weigh over 70 lbs. In most cases you won’t need to consider a more powerful bow until your son or daughter reaches 100 pounds. This is even true if your youngster is already familiar with a bow. Being able to easily draw the bow back will also give kids time to work on their aim and accuracy, along with their firing position. With plenty of practice with a lightweight and easy draw bow, you child could soon become skilled enough to consistently hit the intended target. While it will take some time to find the right youth bow for a child, it is well worth the extra effort the first time you see your kid draw and fire. Whenever you are purchasing anything that could be considered a weapon for a child it is always important to put safety ahead of any other considerations, this also includes your own preferences. Most youth bows are affordably priced so you can easily find one that fits your budget, and the low cost also makes it easier to upgrade to a larger and more powerful model when your child is ready.